It’s been two years since I posted a proper macaron recipe and even longer since I celebrated a proper Mardi Gras. Put ‘em together and whaddya got? 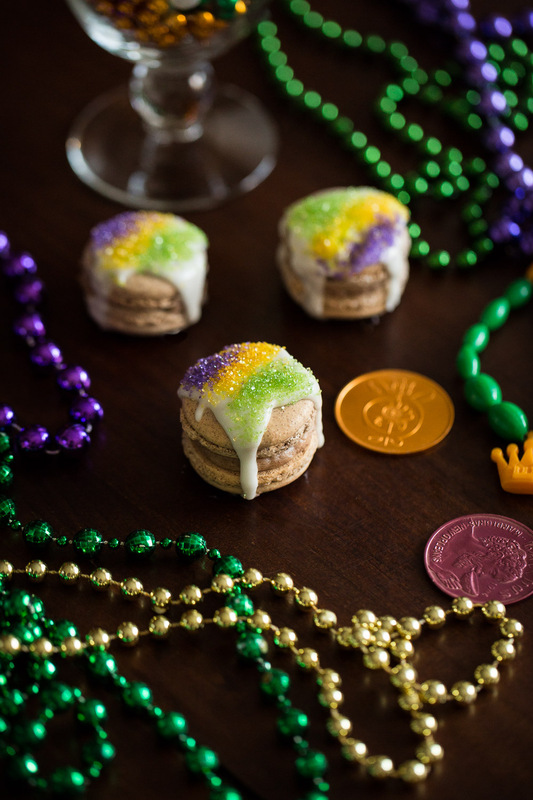 Here’s my King Cake macaron recipe just in time for Fat Tuesday. 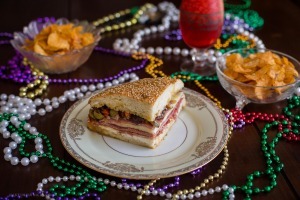 The King Cake is an essential part of any Mardi Gras celebration. 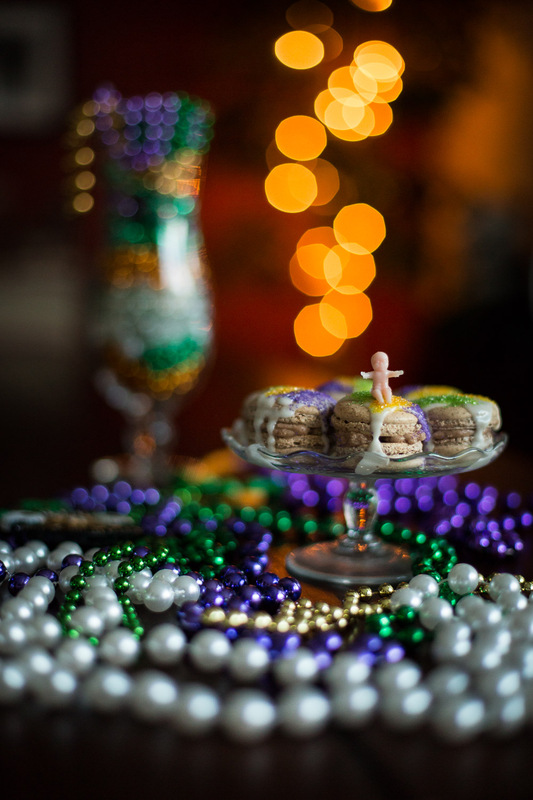 Honoring the Three Kings who brought gifts for the baby Jesus on Twelfth Night, King Cakes are generally consumed between Twelfth Night (King’s Day) and Mardi Gras. 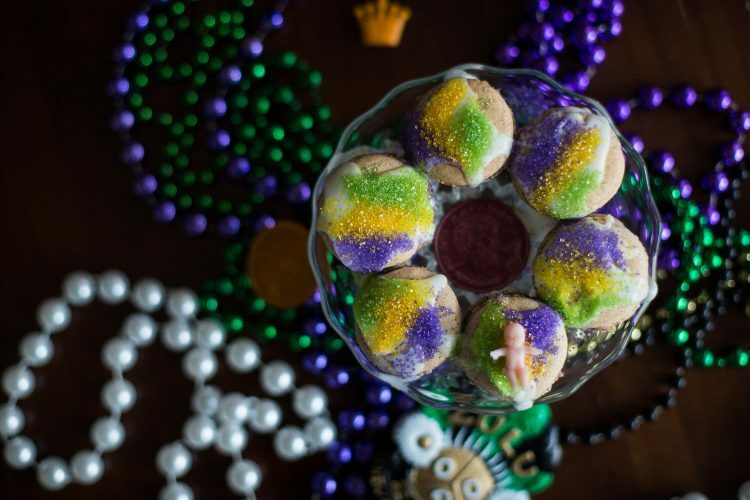 King Cakes take the shape of a ring (crown) of dough with a Danish/coffee cake filling rolled inside. 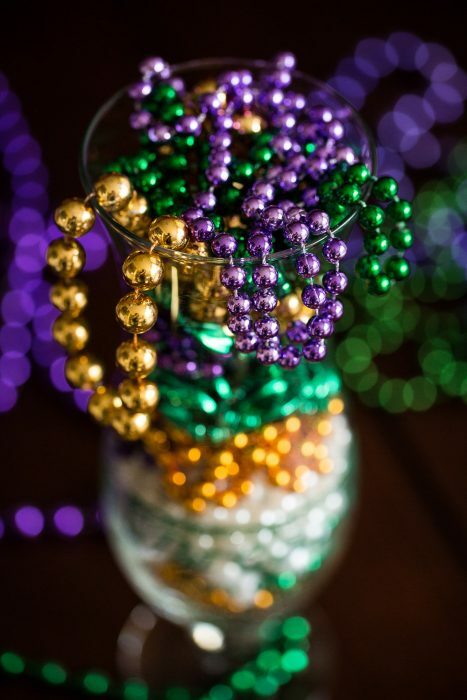 The top is glazed with icing and dusted in the colors of Mardi Gras: purple (justice), green (faith) and gold (power). Perhaps the most important feature of every King Cake is the tiny plastic baby that is inserted inside. The baby has come to represent Jesus and ties into the story of the Epiphany. 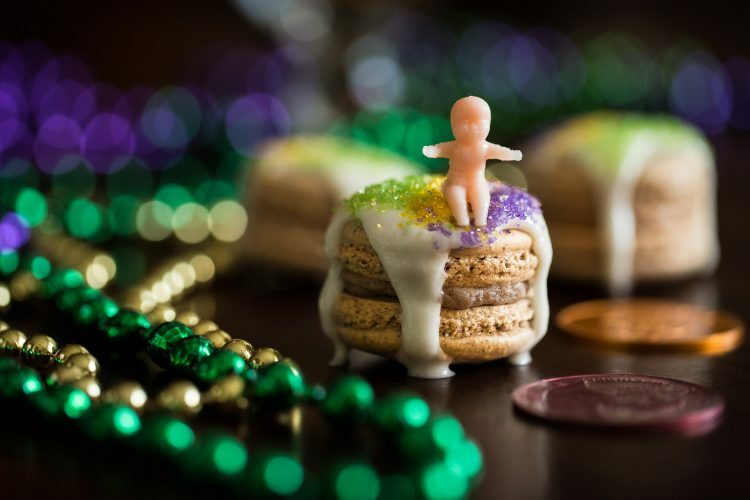 But in practical, contemporary terms, the person who receives the baby in their slice of cake is named King/Queen and is then responsible for purchasing the next King Cake (or hosting the next party)! 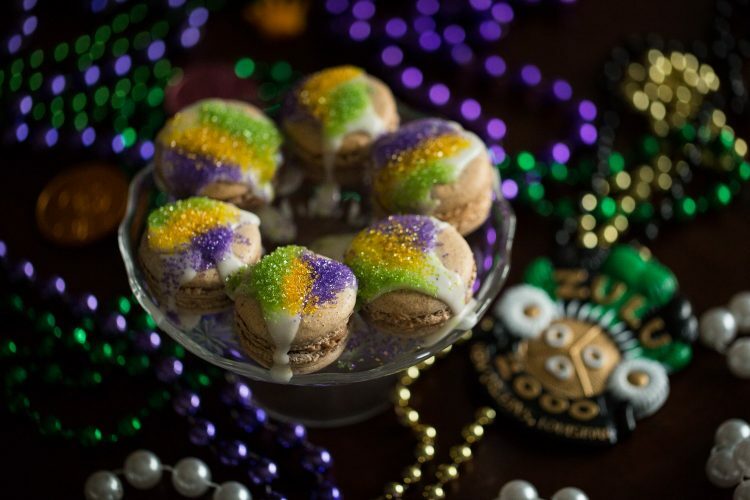 Most Mardi Gras maracron recipes are rather basic and simply involve using food color to transform ‘generic’ macarons into Mardi Gras colors. Very few contain much thought into flavoring them. Moreover, there’s a veritable dearth of King Cake macaron recipes. 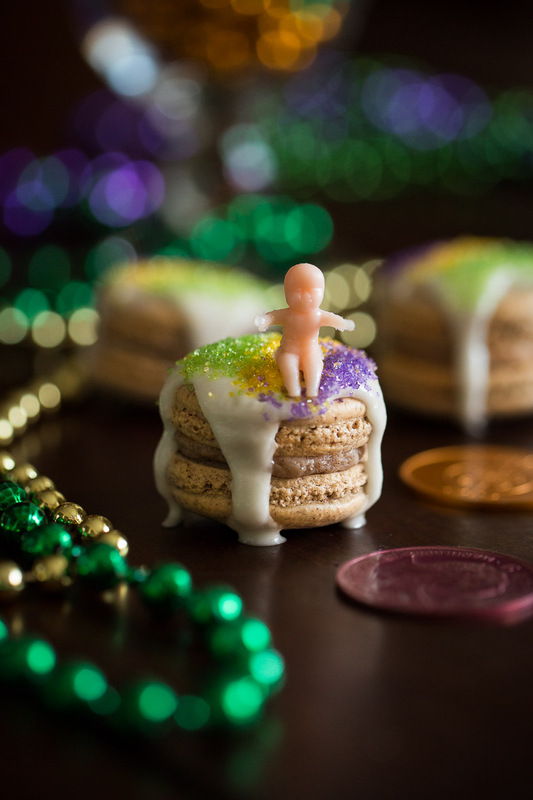 Because of that, I decided to approach these with the intention of making them as close to a legitimate King Cakes as possible. I got close. But there’s still work to be done. More on that in a sec. First, another shoutout to Cristina Valencia and Jordan Vineyard & Winery, whose macaron recipe is still the best (and easiest!) I’ve ever tried. 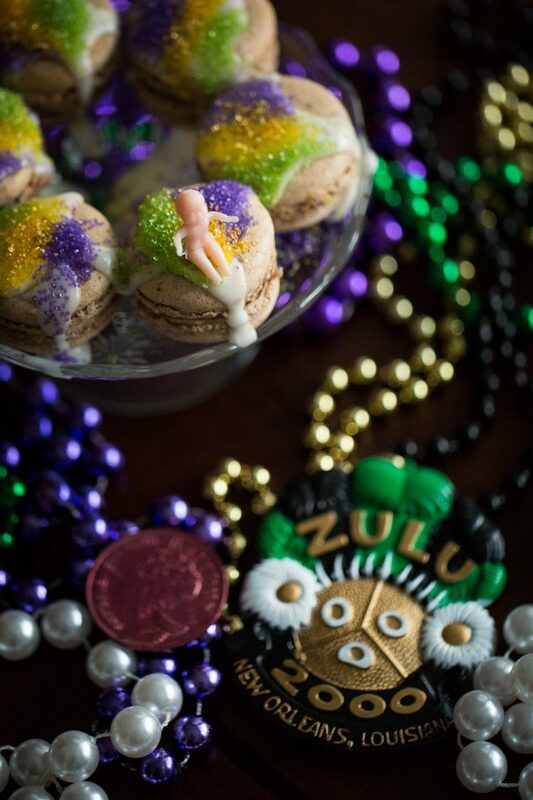 The goal with these macarons was to remain faithful to the spirit of a King Cake. For the cinnamon/danish filling, I opted for a cinnamon buttercream. For the shells, I used cinnamon simply to tint the color yellow/brown. Finally, for the icing, I made a simple vanilla cream glaze. The macaron shells baked better than usual, perhaps due to the unseasonably warm temps and low humidity. 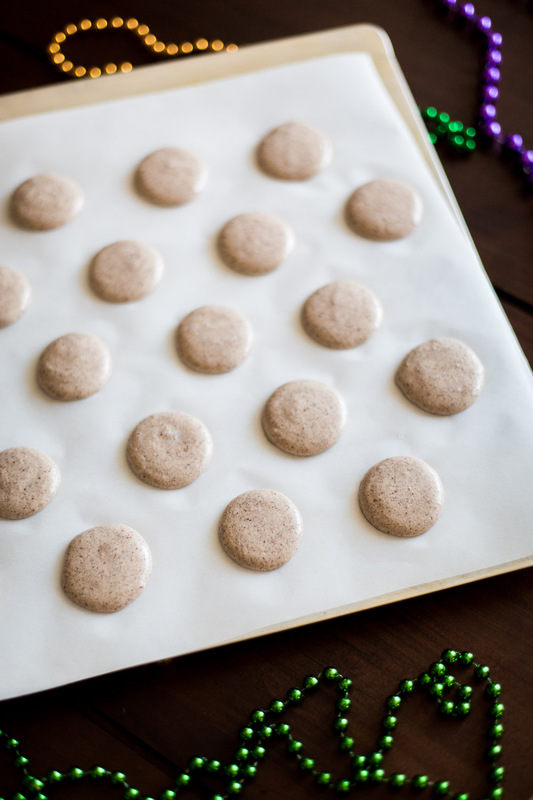 Macaron shells, by themselves (i.e. just the almond flour/egg combo, without any flavoring/color) come out plain white. By adding cinnamon, I was able to tint the shells brown. But that said, I’m not sure I matched the King Cake color as faithfully as I’d hoped. 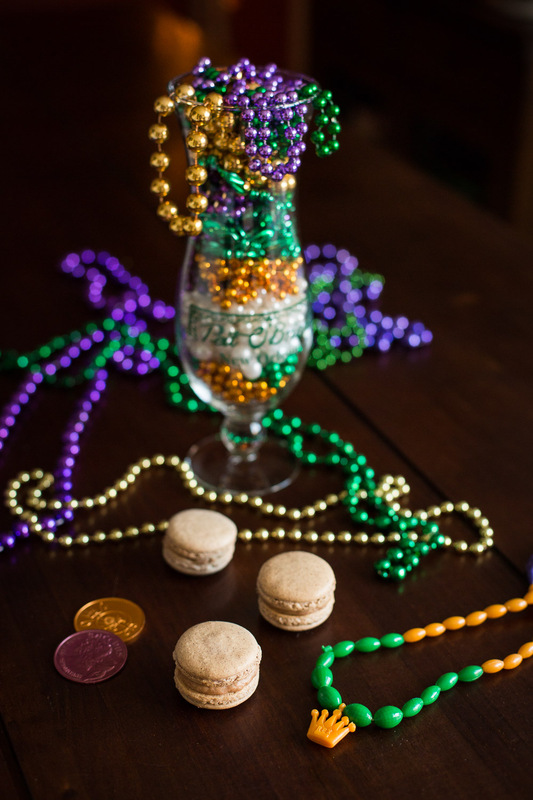 In the future, I might add a single drop of yellow food coloring to help push it closer. 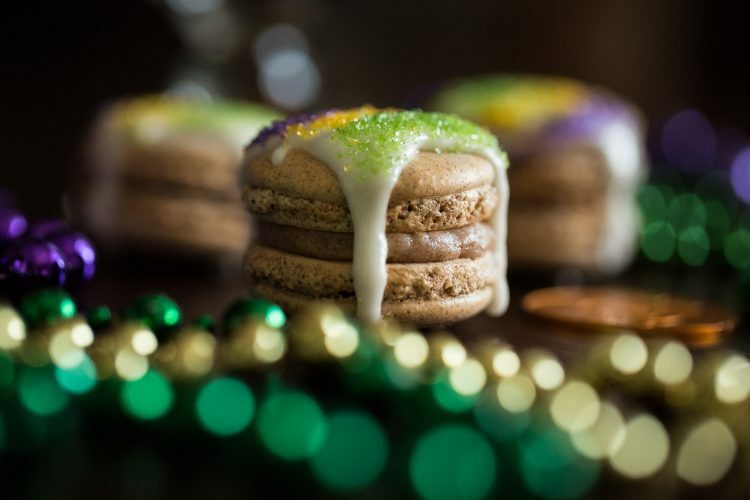 The cinnamon buttercream filling worked out fine, but wasn’t terribly inspiring. Which is to say: I’ve come to love/hate buttercream. It’s ridiculously easy, but a little too one-note. 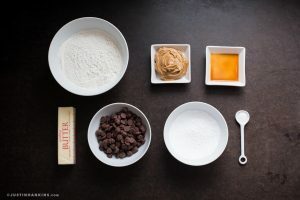 Maybe it’s just me, but once I learn something is buttercream, I can’t divorce my thoughts from the realization that I’m basically just eating spoonfuls of butter. 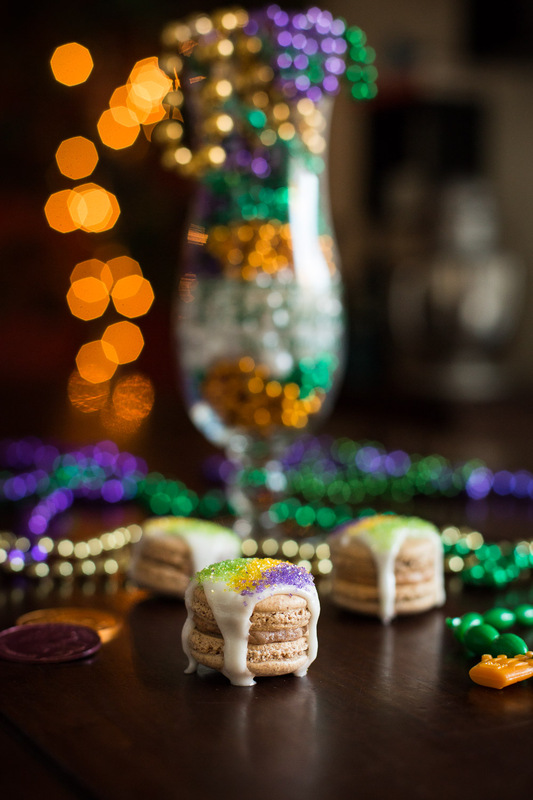 If/when I try this again, I’d think about a more creative option for the filling — like maybe a streusel or something with a little more texture. And as long as we’re talking about “opportunities for improvement,” I might add a squeeze of lemon to the glaze as well. 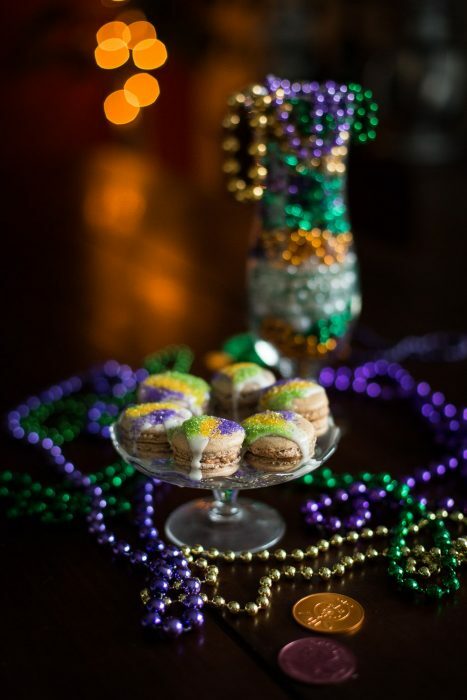 The small size of the macaron makes any post-baking decoration rather challenging. The vanilla cream glaze, in particular, was tricky to apply because it was so thin and took so long to set. Not to mention, the macaron shell’s round surface area made it difficult to replicate the King Cake drizzle (which, incidentally, used to be my rap stage name in high school). I eventually bumped the powdered sugar content to thicken it up, which helped during application but was still rather messy. 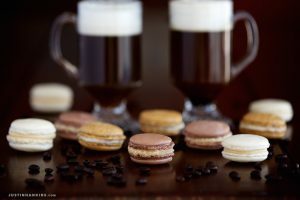 One tip that might help is to stick the macarons in the freezer for a couple minutes after applying the glaze to help set it. 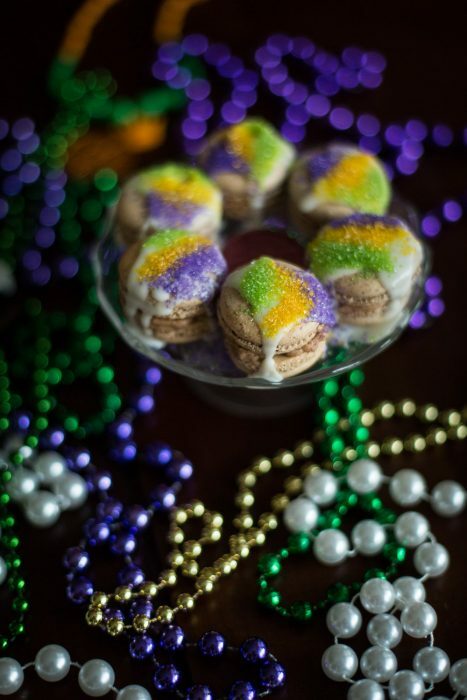 Finally, topping the macaron with sanded sugar presented two options: either randomly scattering all three colors at once, or applying each color individually. 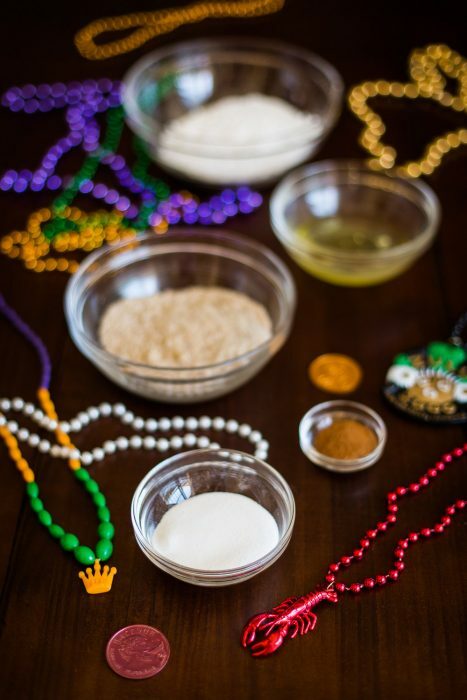 I tried both and, although more time consuming, the individual “stripes” was more appealing to me and remained far more faithful to a proper King Cake. The easiest way I found to apply the stripes was by using an index card to mask the areas I didn’t want to cover and to direct the sugar exactly where I wanted it. 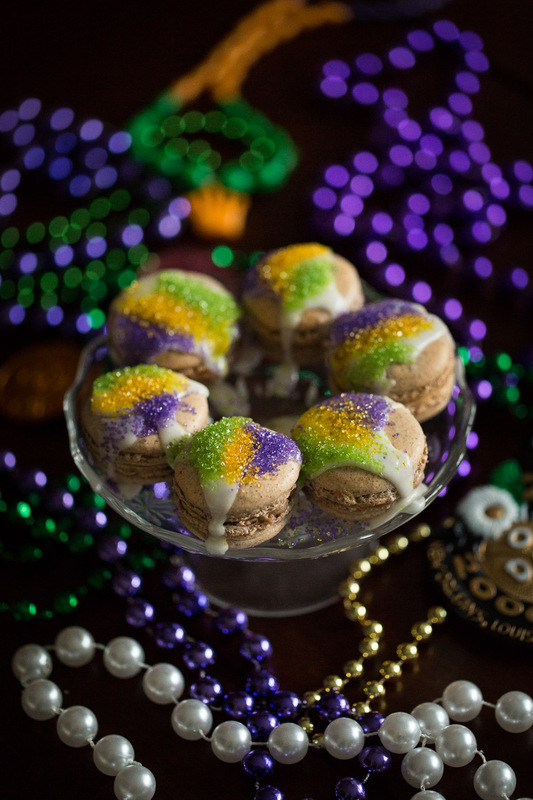 Originally, I had intended to bake and decorate individual macarons. It wasn’t until strategizing with a friend (Hi Carlyn!) 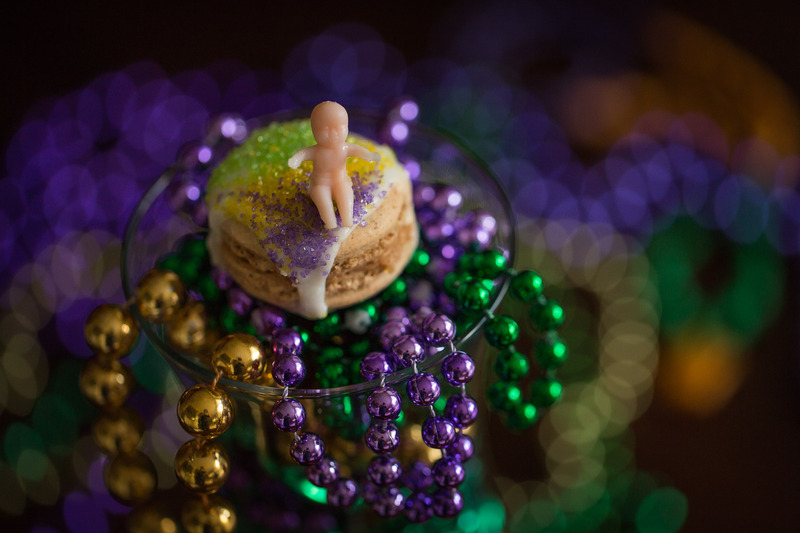 that we came up with the idea to assemble them in a ring in order to replicate an actual King Cake. Hashtag duh. That’s how it should be done in the first place. 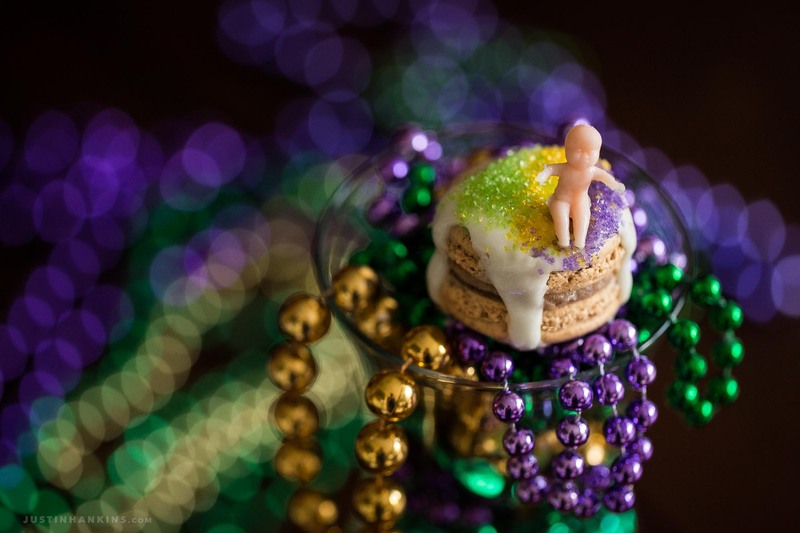 It’s the best of both worlds: it maintains the spirit of a King Cake while also allowing for individual macaron enjoyment. Not to mention, it’s a thousand times easier dealing with the glaze and sugar when doing it this way. 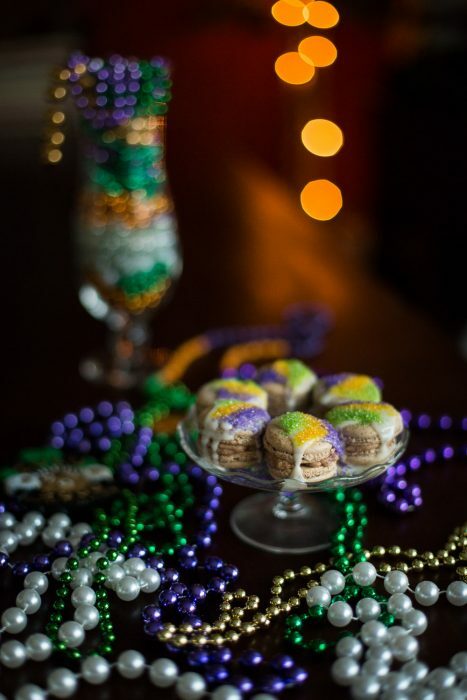 Things I’d change next time: adding a little yellow food coloring might help to push the macaron shells toward the traditional King Cake color. Additionally, I’d explore a more streusel-like filling with some a different texture. I’d add a squeeze of lemon to the glaze. And finally, having now had practice with the glaze, I’d probably chill the macarons in the fridge before drizzling, then immediately transfer them back to the fridge to help set the glaze. Before it hardens completely, I’d then add the sugar. Let me know if you try this, yourself, and have your own tips or experiences! 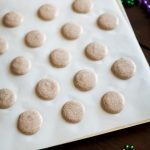 This recipe is for the macaron shells and intended to be used alongside the cinnamon buttercream and vanilla glaze recipes. 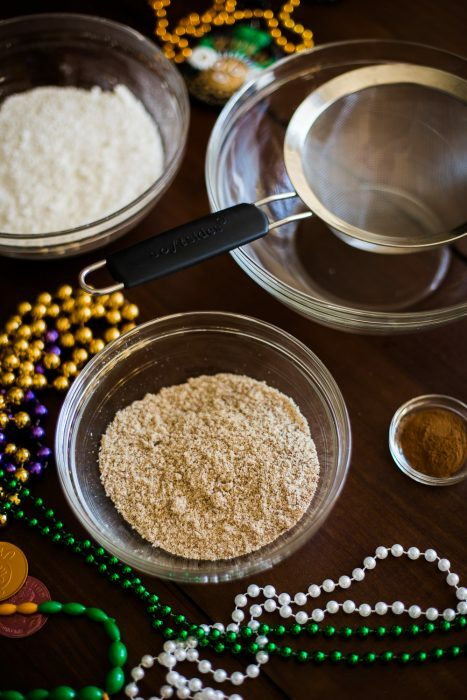 Line a cookie sheet with parchment paper and prepare ingredients ahead of time. 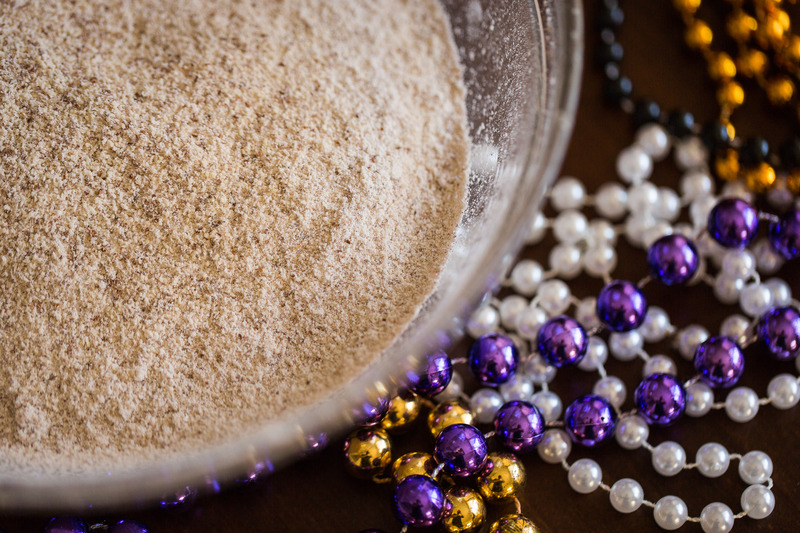 Sift almond flour to eliminate any large chunks. You want to end up with 75g, so add more to take place of any you need to discard. Combine almond flour, powdered sugar, and cinnamon, then sift together. 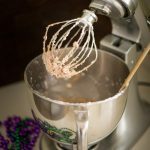 In a stand mixer, beat egg whites on high. As egg whites become foamy (~30 secs), add a pinch of Cream of Tartar. Remove bowl from mixer and fold in half the dry ingredients. After the first half has been incorporated, fold in the second half. Slowly continue folding — you want to make sure everything is incorporated. You don't want to be too aggressive, but you also don't want to under-mix. The consistency you're looking for is thick and lava-like. It should flow slowly down the sides of the bowl. Adapted from Cristina Valencia & Jordan Winery. 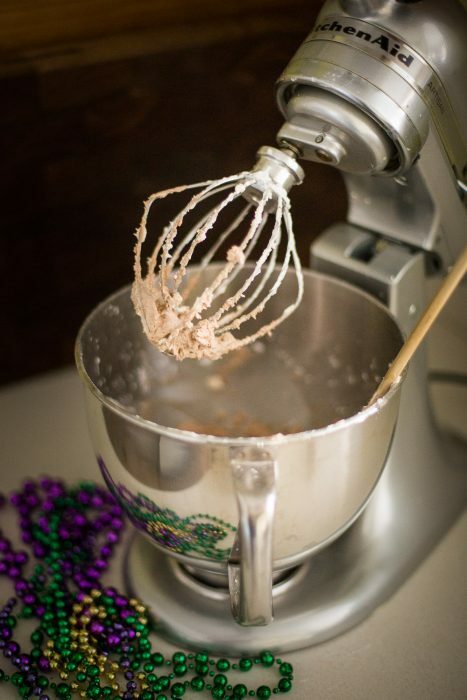 In a stand mixer, beat the butter with the whisk until light and fluffy. Add vanilla and continue beating until combined. Scrape down the sides as necessary. 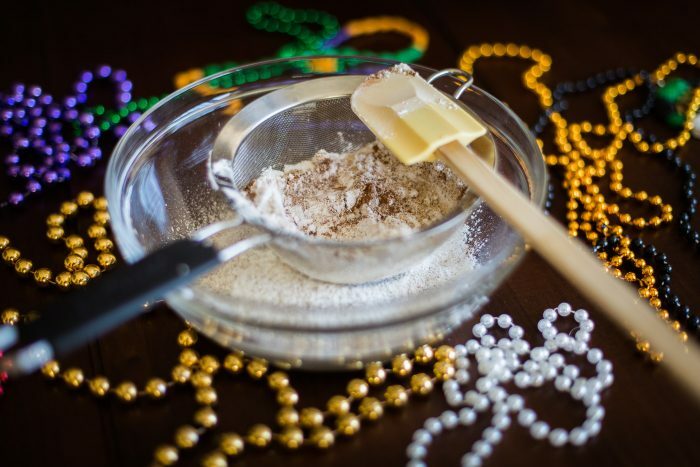 Add cinnamon and powdered sugar and beat until combined. Add heavy cream and beat for a couple minutes until the buttercream becomes fluffy. 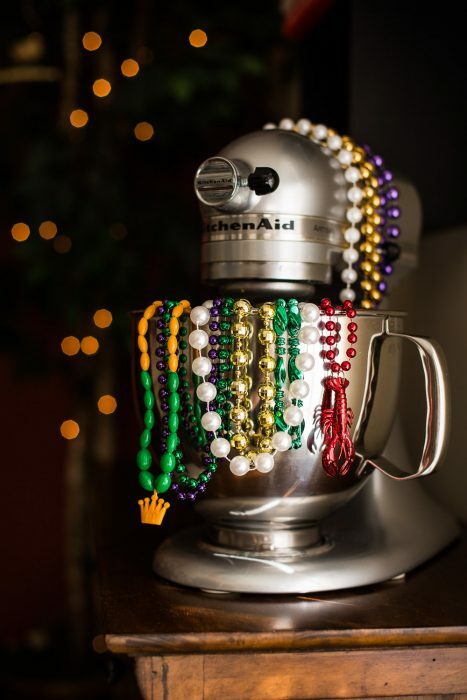 Add buttercream to piping bag and pipe as needed. Combine ingredients into a bowl and mix until smooth. It may take a few minutes to get rid of lumps. 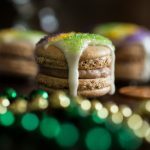 Glaze might be a little too thin to use on macarons. To thicken the glaze, simply add more powdered sugar. 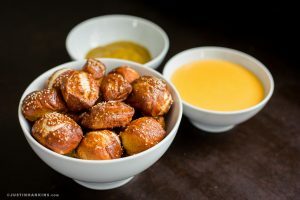 Alternatively, you can try chilling the glaze slightly to help it set. Justin, these are beautiful. I had the idea to make king cake macarons last year and will finally make some on Saturday. I am using the way you decorated your macs as my inspiration. I am going to fill them with a cinnamon cream cheese frosting and candied pecans. Wish me luck! I hope mine turn out half as cute as yours did.